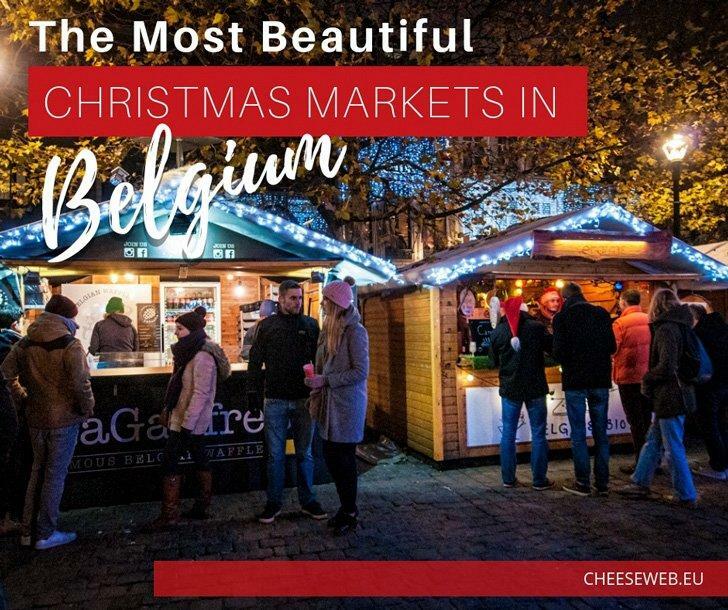 As we know, good things come in small packages and the ability to drive (or travel by train) from one side of the country to the other in a couple of hours means you can visit a wide variety of Christmas Markets in Belgium in a short period. We’ll share where to base yourself at the best hotels in Belgium for Christmas Markets access, and I’ll share some tips from my own Belgian Christmas Market marathon 2017, with my Mom. Read on for loads of holiday goodness! 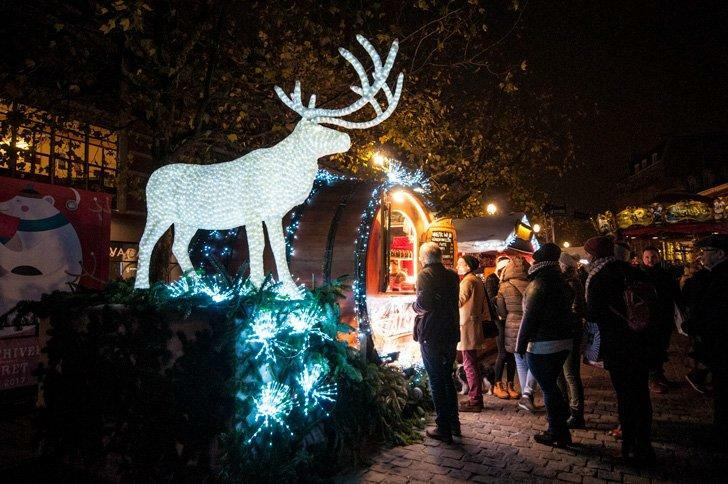 Be sure to visit our Christmas Market schedule for this year’s dates for these and dozens more Christmas Markets in Europe. Known as Plaisirs d’Hiver (Winter Pleasures in French) and Winter Pret (Winter Fun in Flemish), the Brussels Christmas market runs from late November to early January. It’s one of the largest and longest running Christmas Markets in Europe and, in my opinion, one of the best. 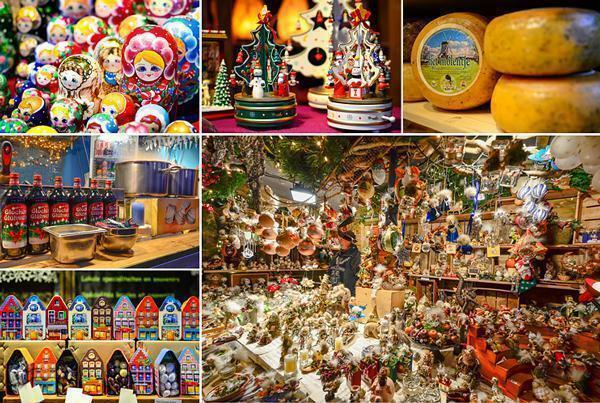 The Christmas market consists of more than 240 chalets running from Grand Place to Place St. Catherine. In these chalets, you can find everything from Russian matryoshka dolls to colourful woollen hats. There are handmade candles and soaps, knives, leather goods, jewellery, handbags, children’s toys, and of course, Christmas decorations of all descriptions. When you’re shopped out or need to distract the children, you can take a break and get a bird’s eye view of the market from the Ferris wheel. There are also two unique marry-go-rounds for the kids. You can even take a spin around the skating rink. Each year there are new art, light, and sound installations, so you never quite know what to expect. If you’ve never visited before, I highly recommend you book the opportunity to visit the Brussels Christmas Market with a local. As travel and culture junkies, we love to see which visiting countries and regions will appear at the market. In 2017, my Mom and I watched Albanian dancing and bought yak wool socks from a Mongolian yurt! There is plenty of food to choose from at the Brussels Christmas Market. All of this excitement and shopping is bound to make visitors hungry. One of the best things about the Brussels Christmas Market is the food. 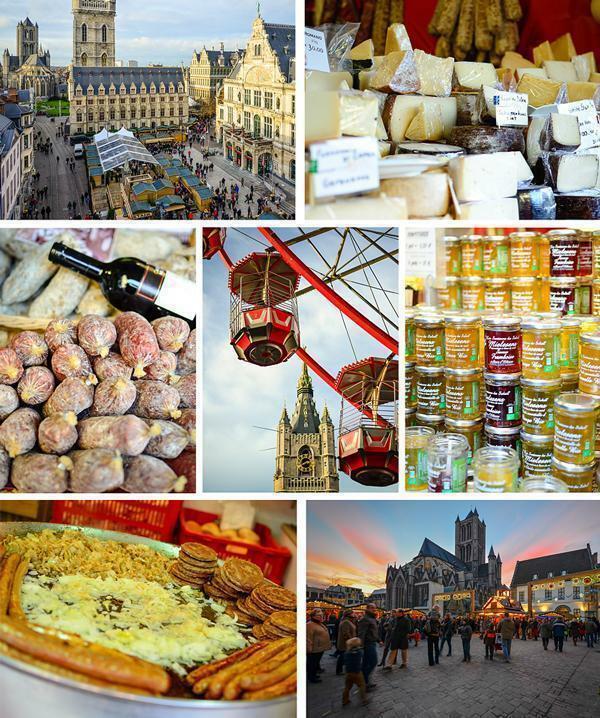 There are foods to take home – artisanal sausages, cheeses, bread, preserves, and foie gras. But you can’t enjoy the market on an empty stomach. While there are food vendors scatted throughout the market, the majority of them are centred in front of the Bourse on the now-pedestrianized Rue Anspach. Andrew’s favourite Christmas Market treat is the German sausage. 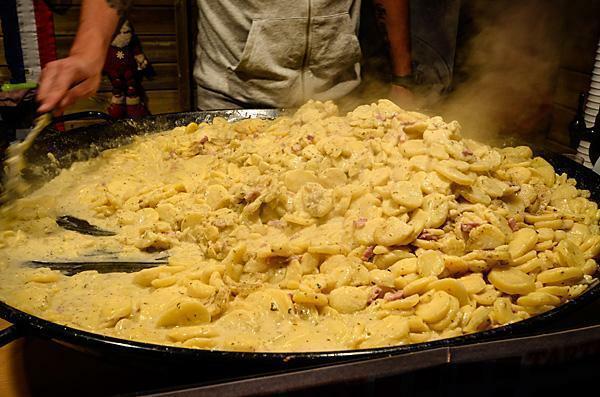 For me, it is all about the Tartiflette, a French concoction of potatoes, bacon and cheese. Tartiflette a Christmas Market treat! There are the inevitable Belgian frites, and various forms of fried dough. We’ve also spotted stuffed baked potatoes, fried mushrooms, and a tapas bar. All of this outdoor food goodness can be washed down with a Belgian beer or the more festive Vin Chaud (hot mulled wine). Our favourite Christmas Market food tradition also coincides with my favourite part of the market. We head to Grand Place for a glass of champagne, a plate of oysters, and a plate of foie gras and watch the Electrabel Nights light show. 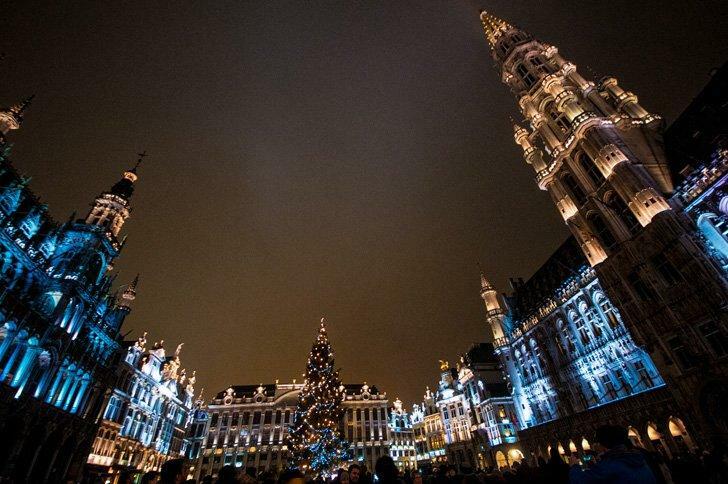 Lights, music, and loads of festive spirit at the Grand Place Christmas light show in Brussels, Belgium. 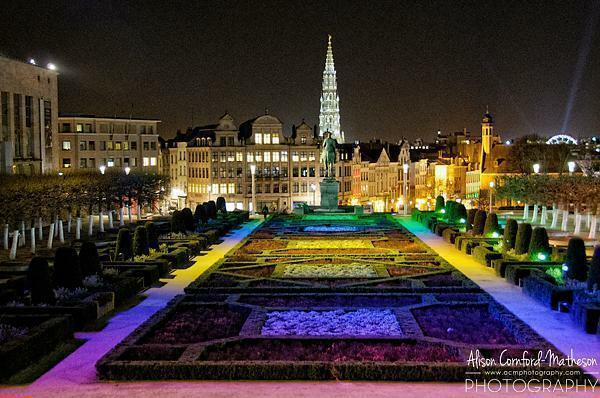 Each year, Electrabel (the power company of Belgium) sponsors a light and laser projection show in Grand Place. Colourful images, set to music, are projected onto the Town Hall building. Every year the show is different and spectacular to watch. For me, Brussels has the best Christmas in Belgium if not the best Christmas Market in Europe. There are plenty of hotels in the heart of the Brussels Christmas Market. Where you stay will depend on your budget and how close you’d like to be to the action. In 2017, my mother and I opted for an aparthotel, a full-service hotel with a kitchenette and laundry facilities, as we were staying for an entire week. We debated between two properties; the Aparthotel Adagio Grand Place, in the middle of the market, and the Aparthotel Adagio Access, further away but still walking distance and close to a metro station. 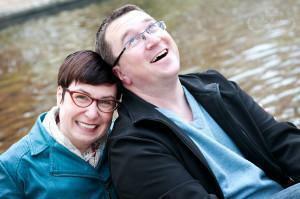 We opted for the more distant property as we wanted to be able to escape the crowds and noise. Adi shares her thoughts and photos from the Bruges Christmas Market, a gem of Flanders, as well as the Markets in Ghent and Ypres. I don’t need an excuse to visit Bruges, any time of the year. It’s one of my favourite cities to visit in Belgium. 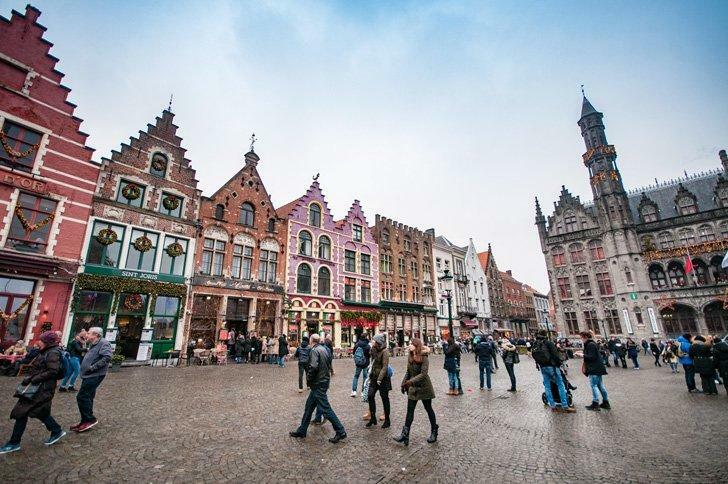 With its winding canals, cobblestone streets, and traditional Belgian architecture, it’s hard to deny Bruges is one of the world’s top destinations. Being so close to the coast, you can even book a day-trip from London to the Bruges Christmas Market if you’re short on time. I have been to Bruges many times, during all seasons. However, winter is, by far, my preferred time to visit this exquisite city. The main reason – the Christmas season. Every year, starting mid-November, Bruges becomes a winter wonderland. Christmas decorations and lights adorn the city center making it even more beautiful; a nearly impossible feat in an already stunning city. 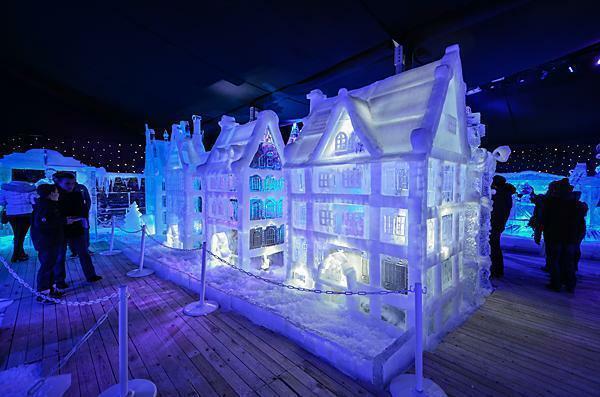 A great place to begin your holiday visit to Bruges is the Snow and Ice Sculpture Festival, which takes place right at the Central Station. Every year there is a new theme. The temperature inside is -6C, so dress warmly. At the end of the tour, your kids can enjoy the enormous ice slide. Adults can warm up at the ice bar with a shot of hard liquor, hot coffee, or gluehwine – a traditional Christmas, hot wine based, drink. From the Central Station to the center of Bruges is about a fifteen-minute walk. 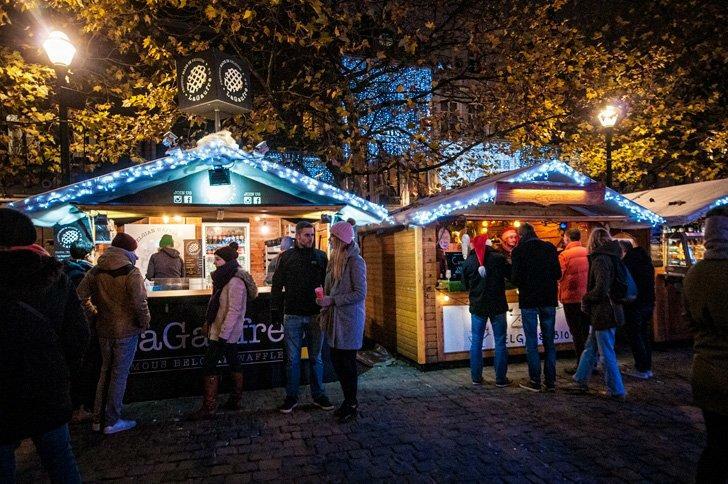 Once you reach Simon Stevinplein Street, the first part of the Bruges’ Christmas market unravels in front of you. The Christmas market is relatively big and divided into two parts. Half takes place on Simon Stevinplein Street, not far from the Grote Markt, and the other half is in the Grote Markt itself. From one section to the other, takes less than five minutes walking. Bruges, Belgium in her holiday finery. 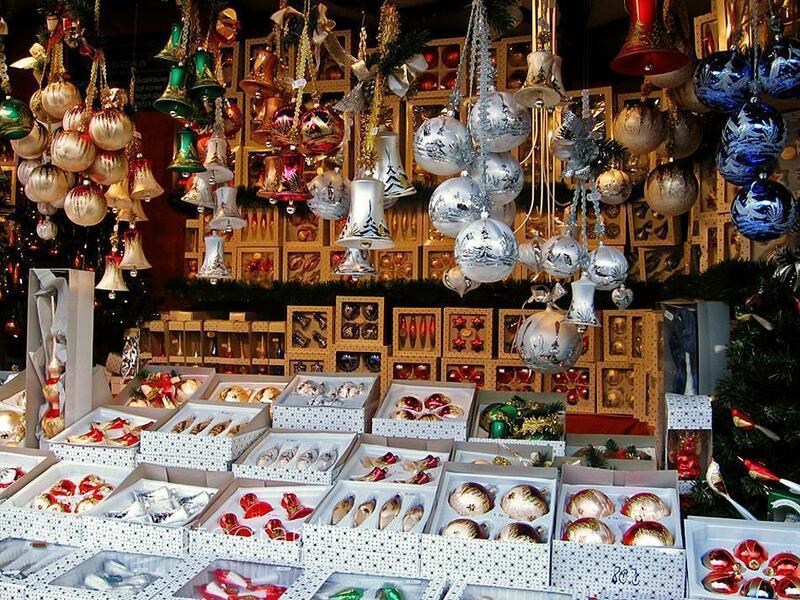 Many Christmas Market vendors display their homemade trinkets, winter clothes, and Christmas decorations. But the market doesn’t only display Christmas ornaments. You can also find great local cheeses, hams and sausages, and chocolate, wrapped in beautifully decorated boxes. Chocolate stores, including the famous Chocolate Line, flank the market, offering delicious treats. In the Grote Markt, you can visit the second part of the market, on either side of a beautifully decorated ice-skating rink. The price for renting the skates is low, and the fun is guaranteed. The entire Grote Markt looks like a fairy tale. The buildings are covered in lights; everything seems to sparkle. Food and hot drinks are also sold here, at low prices, perfect for travellers on a budget. The Belfry is open until 6 pm and, if you don’t mind climbing the 366 steps in the 83m tall (and very narrow) tower, you’ll be rewarded with exceptional views of Bruges and the Christmas Market. If you feel you need a break, after the busy Christmas Market, walk to the Burg Square, just off the Grote Markt, to the left of the Belfry. It’s beautiful this time of year, decorated with lights and a large natural Christmas tree in the middle. On the short walk, you’ll pass by a few good restaurants, like Breydel De Coninc (the mussel and lobster restaurant with the best reputation in Bruges), traditional lace stores, and chocolate shops. There are plenty of options for hotels in Bruges near the Christmas Market and city centre to suit all budgets. Follow this link to check prices and reviews for your dates. Ypres, Belgium Christmas Market at night. Roughly an hour and a half from Brussels, the city of Ypres (Ieper) is well known for some of the biggest battles of World War I. These days, Ypres is most known to tourists for the memorials dedicated to the soldiers who lost their lives, on the battlefields. 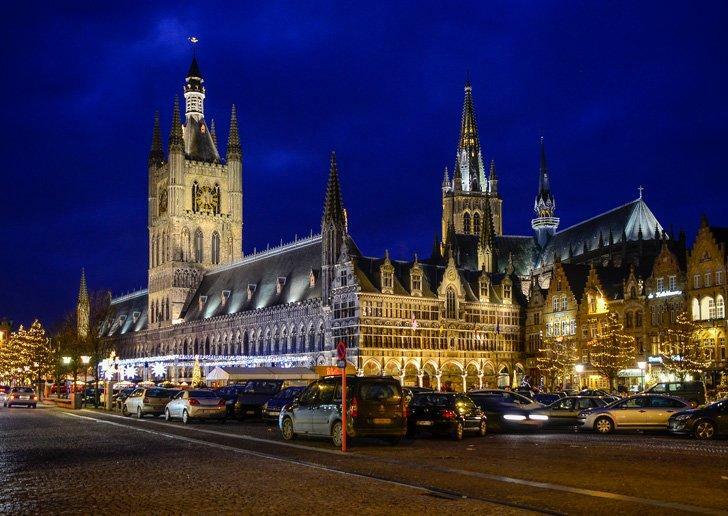 However, from the end of November, Ypres becomes a city of holiday delights. 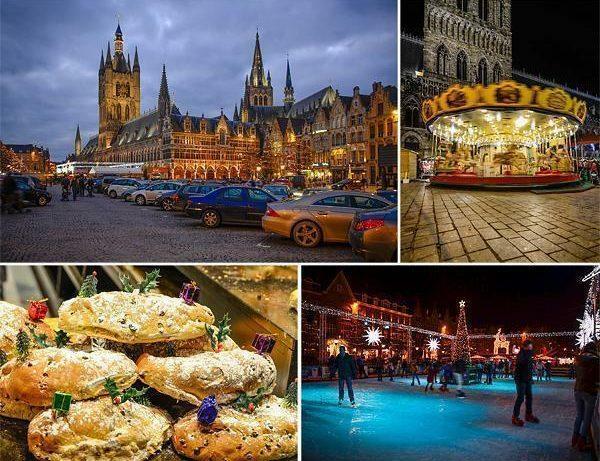 The Christmas market in Ypres is relatively small and consists of chalets where vendors sell winter clothing, a wide selection of beer, and plenty of food and hot glühwine. The ice skating rink is a good size, and like other markets in Belgium, the price to rent skates is low. For smaller children, who cannot enjoy the ice skating rink, there is the option of riding a lovely merry-go-round. The city did a fantastic job decorating the center. There are lit evergreens and lights illuminating the streets in and around the center. There is an opportunity to ride beautifully decorated caravans, pulled by draft horses, for free. Shops selling local products, including local and novelty beer, are at every step. There are also plenty of restaurants and cafes nearby. If all you want is a quick and very cheap snack, try the “Paris Croissant” bakery. Their raisin bread, among other things, is unbelievable. The Christmas Market in Ghent (Gent), known as Gentse Winterfeesten (or Ghent Winter Festival) was the one of the best I’ve visited. 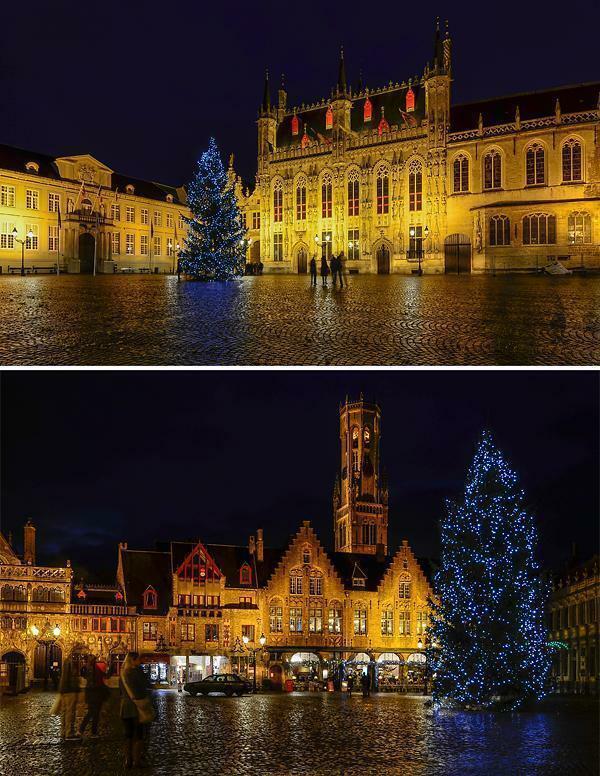 Just forty minutes from Brussels, the entire center of Gent is sparkling with lights. 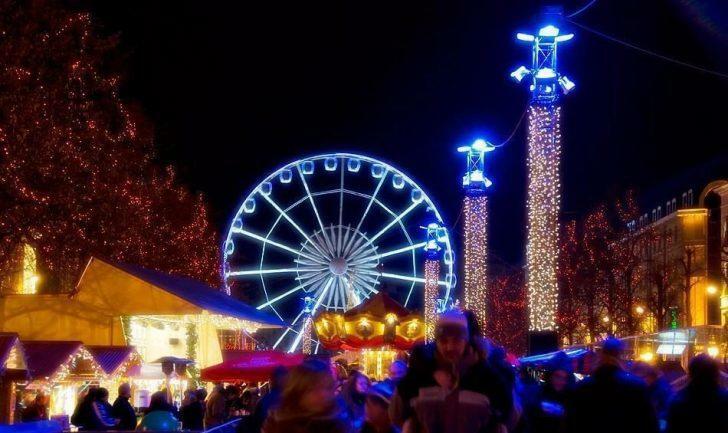 The Christmas Market stretches across Sint-Baafsplein, Klein Turkije, and Korenmarkt. There is something for everyone at the Ghent Christmas Market, a large ice-skating rink, merry-go-rounds for the little ones, great shopping from vendors selling ornaments, winter clothing, and much more. One thing I loved was the fabulous and diverse street food. There are Italian tables selling sausages, hams, and fine cheeses. We also found vendors selling a wide variety of organic honey and mustard, (most of them I’ve never heard of and you can taste them all). Foodie treats – Ollieballen, sauteed mushrooms and pumpkin soup. Don’t miss the very addictive oliebollen (the name in Flanders and croustillons in Wallonia), a traditional Belgian treat. They are small, deep-fried dumplings, a little like doughnuts but much softer and slightly chewy, covered in powdered sugar. Once you have one, you can’t stop. 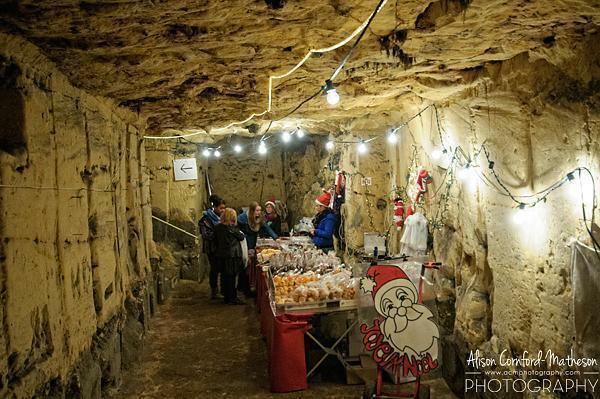 Sweet treats in the Grottes de Wonck; Belgium’s unique Christmas Market in a cave. When I first heard about a Christmas Market in a network of caves in the province of Liege, I knew Andrew, and I would have to visit. When we visited Les Grottes de Wonck, we were pleasantly surprised by the uniqueness of the setting as well as the quality of the products on offer. Often, the items for sale at Christmas Markets are virtually the same everywhere you go, coming straight from the same factory in China. Not so, at the Grottes de Wonck – it’s a truly artisanal market. There is plenty of local produce, including wine, cheese, sweets, and cured meats, as well as paintings, jewellery, and other handicrafts, all made by hand locally. Although the Christmas Market only happens for one weekend a year in the village of Wonck, it is very well organised. There are multiple free parking lots set up outside the village and a crossing guard to help with traffic. A large tent is set up at the bus depot, where you can keep dry and warm, with hot wine, while you wait for the free shuttle bus. The bus takes you through the village and up the steep climb to the Grottes. Tickets to enter the market were 3 euro when we visited, and there are two main cave networks to visit. The caves are estimated to be more than 2000 years old and take up some 10.000 m². Luckily the Christmas Market isn’t that big. The caves were dug initially to mine for flint and also to use the tufa stone in building construction. 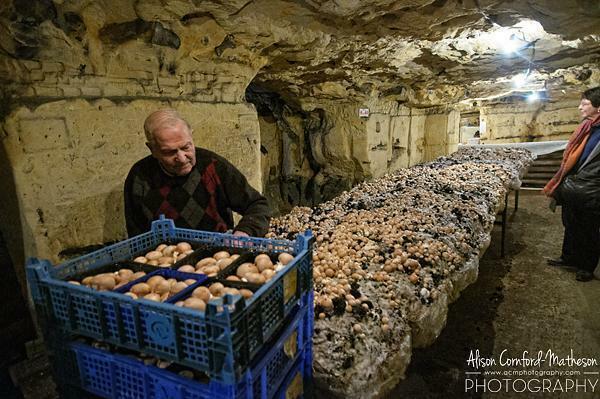 Now the Grottes de Wonck are privately owned and used to cultivate mushrooms. 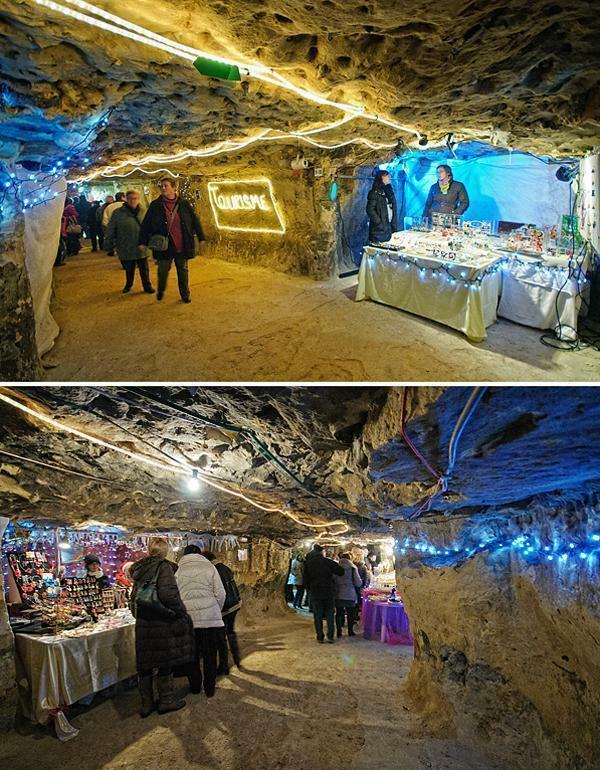 You can also find a sizeable underground restaurant, which you can enjoy during the Christmas Market. We had a mini feast of fresh oysters and champagne and were tempted by the sautéed mushrooms (talk about local!) and tartiflette. The Leuven Christmas Market or Leuvense Kerstmarkt is smaller than its counterpart in Brussels, with about 140 stands, but it’s equally festive. It makes a nice alternative to the bustle of the big city. There is a handicraft market as well as lots of tasty food to enjoy. We found many of the same items on offer as the Brussels Christmas Market but the crowds were smaller, and there are plenty of unique boutiques in Leuven, making for a lovely overall Christmas shopping experience. Each year, a local charity is also highlighted at the market, to help keep the spirit of giving alive during the holiday season. The Leuven Christmas Market is an easy train ride from Brussels, or you can bring your car and park in one of the many garages in the city centre. Or avoid the crowds and take the free shuttle bus from Philipsparking. The Village de Noel, in Liege, was a pleasant surprise and, for us, is one of the best Christmas Markets in Wallonia. The market wanders through streets and alleys, to end at Liege’s central square. There are more than 200 chalets with gifts, decorations, food and drink. If you are looking for authentically Belgian gifts, the market sells hand-blown glass Christmas ornaments, featuring Liege and Walloon folk characters: Tchantchès, Nanesse, Marcatchou, the miner, and Gilles de Binche. 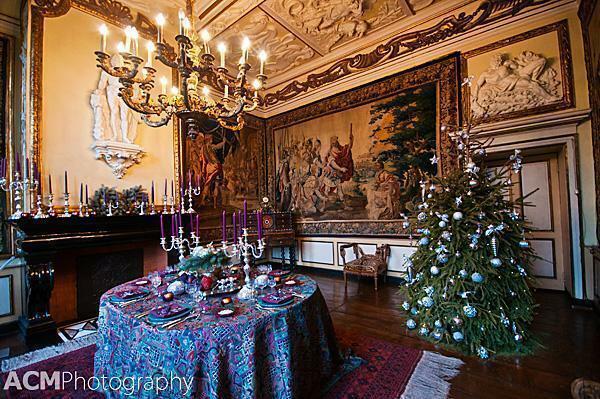 While the Château de Modave isn’t strictly a Christmas Market, it is definitely a holiday event you should add to your December calendar. Usually, winter isn’t the time of year I think about visiting castles in Belgium. Cold stone walls, drafty windows and desolate, frozen gardens don’t make for an ideal Château experience. However, Christmas at the Château de Modave makes this Belgian castle a worthwhile winter visit. The Château de Modave sits, perched on a rock, 60 metres (200 feet) above the Hoyoux river in the province of Liège, Belgium. The oldest parts of the castle date from the 13th century, but the building you can visit today was primarily rebuilt in the mid-1600s. The Château was owned by Jean-Gaspard-Ferdinand de Marchin throughout the 1600s and is also known as the Château des Comtes de Marchin. Over the years, Château de Modave has been owned by numerous noble families until, in 1941, it was purchased by the Intercommunale Bruxelloise des Eaux (“Brussels Intercommunal Water Company” or Vivaqua). The company opened Modave to the public and has been conducting restorations with Wallonia Heritage ever since. 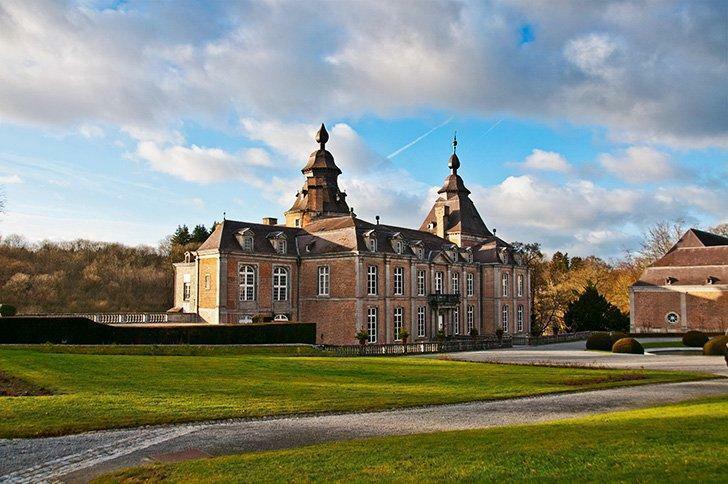 The Château de Modave is off the beaten path in Wallonia. First, you pass through the city of Huy and continue to the village of Modave, where you drive up to the top of the rock where the castle is perched. 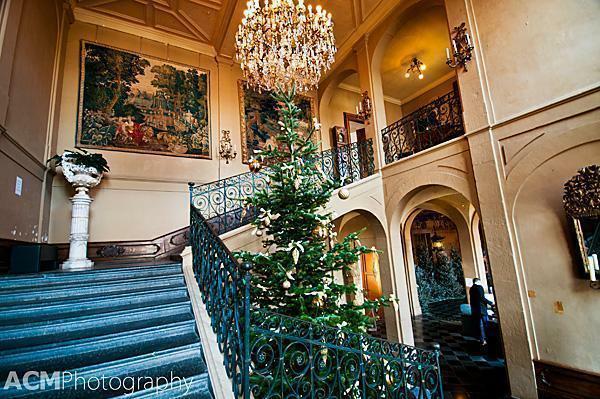 Stepping inside the main foyer, we were at once transported to an ancient castle interior and modern Christmas wonderland. It was a strange juxtaposition but beautiful nonetheless. 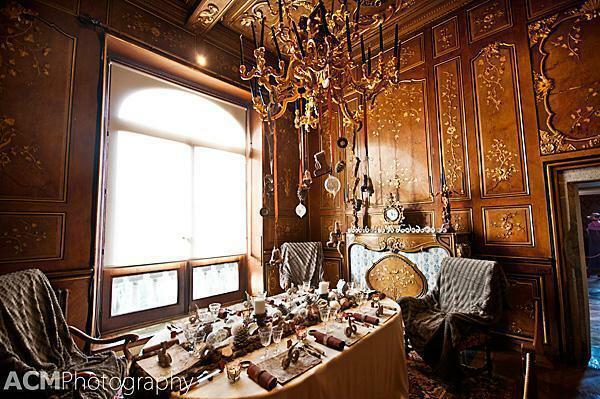 The Château de Modave is filled with beautiful furniture, tapestries, stucco work and art which you can enjoy year round. In addition, at Christmastime, each room is decorated in a different holiday theme. Some of the themes worked better than others, and a couple came off as a bit too tacky for the lovely Château surroundings, but overall it was festive and beautiful. The tour includes a step out onto the balcony to enjoy the view of the river below, as well as a look into the many bedrooms, drawing rooms and the cellars below the castle. There is also a bistro on site if you need a snack. The Christmas decorations are in place in 2018 from December 15th until January the 6th. If you miss them this time, don’t hesitate to visit the Château de Modave when it opens April 1st for the season. Even without the Christmas theme, this Belgian castle is well worth a visit. 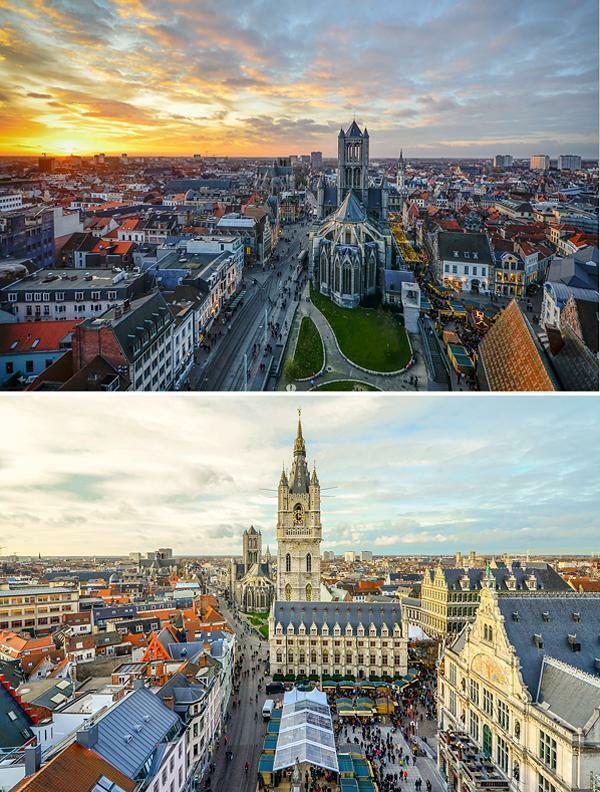 Because of Belgium’s small size, you can base yourself virtually anywhere in the country you choose and still have easy access to the markets. If you are driving your own vehicle or renting a car, basing yourself outside a major city makes the most sense, as parking in the city centres is expensive and challenging. If you opt to travel by train, choose a hub city like Brussels or Antwerp, for easier connections. Whether you visit these Christmas Markets in Belgium before the end of this year’s holiday season or add them to your calendar for next year, there are plenty of places to find the holiday spirit.